England face a fight to avoid defeat on the final day of the second Test after Pakistan continued to dominate. Set a Test record 491 to win following's Pakistan declaration on 354-6, the tourists reached 130-3 by the close of day four in Dubai. Joe Root was unbeaten on 59, having seen Ian Bell fall for 46 after tea. Earlier, Younus Khan went to 118 - his 31st Test century - and Asad Shafiq made 79 as Pakistan added 132 to their overnight total. England will retain some hope of saving the game while the accomplished Root remains at the crease. However, with leg-spinner Yasir Shah and slow left-armer Zulfiqar Babar finding increasing turn on a wearing pitch, Pakistan can reasonably expect to wrap up victory and take a 1-0 lead in the three-match series. Do England have any hope of saving the game? "Small - very tiny," former England batsman Geoffrey Boycott told BBC Test Match Special. "If Root goes quickly tomorrow, it's game over. You've got Jonny Bairstow and Root, then you're down to people who failed - Ben Stokes, a keeper out of nick in Jos Buttler and a tail who won't be able to read the leg-spinner. "If England can get their act together and bat properly, there are no terrors in the pitch." England assistant coach Paul Farbrace told TMS: "There's no point turning up tomorrow if we don't believe we can survive. "There aren't many demons out there. It is turning but it's slow turn and it's about application." 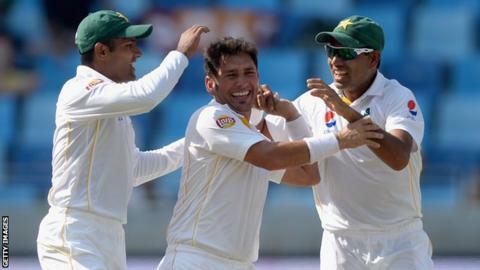 Younus said: "This pitch is slow and England are capable of bouncing back. It won't be easy for us." West Indies' 418-7 to beat Australia in Antigua in 2003 in the highest successful fourth-innings chase in Test history. Has Bell played his final Test? As well as Bell played in adding 102 with Root for the third wicket, his departure in the final hour leaves question marks over his Test future. Former England spinner Graeme Swann said: "The big talking point is Ian Bell. He batted much better today, but his place is still in jeopardy." Bell, 33, has now gone 21 innings without scoring a century, during which time he averages 20. The manner of his dismissal, caught behind via glove as he padded up to Babar, led to renewed calls for England to end his 117-Test career before the final Test in Sharjah. "It might just save his place but I'm not sure it's the right way to go," said Boycott. Ex-England captain Michael Vaughan told BBC Radio 5 live: "In a three-match series I really do think the best thing for Ian Bell and the team is for him to play in Sharjah. "He is averaging over 40 for the series. But his position in certainly under threat before the tour going to South Africa unless he finds that touch." Moeen Ali again failed to convince as an opener, edging an expansive drive at Imran Khan to Younus at second slip. He has scored only 48 runs in four innings since being promoted to the top of the order. But of greater concern for England was the back injury which hampered captain Alastair Cook in the field and reduced him to hobbling between the wickets during his innings of 10. "Alastair is fine; he's not the greatest mover," said Farbrace. "I don't think he's injured. It's to do with the amount of hours he's spent bent over a bat handle scoring thousands of runs." When Cook swept Yasir to Riaz at deep backward square-leg, England were 19-2 and in danger of reprising their first-innings collapse. Root, composed as ever, and an increasingly confident Bell repelled Pakistan for almost 35 overs, but Babar found enough turn and bounce from the footholes to end their alliance 10 overs before the close. Bairstow helped Root avoid any further mishap, but the gaggle of close catchers who surrounded them for the remainder of the day was a sneak preview of what England can expect on Monday. Apparently not. After 41-year-old Misbah-ul-Haq made 102 in the first innings, 37-year-old Younus followed suit with his 31st Test century. Unbeaten on 71 overnight, Younus overcame the loss of skipper Misbah for 94 - driving a James Anderson off-cutter to mid-off - in the third over of the day to extend Pakistan's mammoth lead. Younus was unhurried in defence and occasionally innovative in attack as he added 113 for the fifth wicket with Shafiq, whose compact technique brought 79 off 112 balls. The centurion eventually perished shortly after lunch when a top-edged swipe off Adil Rashid was well taken by Moeen running back from mid-on, and Moeen trapped Shafiq lbw to bring about the declaration. "I'm a happy Pakistani at the moment," said Younus, who has now scored 9,071 Test runs. "For the rest of my life, I will be happy that I am on a list with Sachin Tendulkar, Steve Waugh and Brian Lara. "My motivation are the people back home. If I push myself a little bit more, I can get 10,000 Test runs. I will be in England next summer."